Wolverines have great endurance, strength, and foraging behavior, but its fierce reputation has often been exaggerated. Contrary to stories they will not attack a larger predator, like a wolf or a bear, and avoid these animals as encounters may be fatal to the wolverine. Wolverines have long dense fur that is generally dark brown to black with a creamy white to gold stripe running from each shoulder along the flanks to the base of the tail. A white hair patch on the neck and chest is common. It has a thick body, short legs, short ears, and a broad flat head. Like humans and bears, wolverines walk on the soles of their feet, called semiplantigrade posture. They have curved, semi-retractile claws and can climb trees readily. They are well suited to travel through deep, soft snow. Wolverines are found throughout Alaska but there are areas that wolverines tend to avoid or exist at lower densities because the habitat is not suitable for denning or are highly developed or used by people. They are primarily solitary creatures throughout most of the year. Wolverine spatial patterns include: intersexual overlap, with home ranges of resident males overlapping those of 2-6 resident females; familial overlap, with offspring sharing their mother’s home range; and temporal exclusive intraspecific home ranges, with resident males defending their territories during February through July which coincides with the denning and breeding periods. 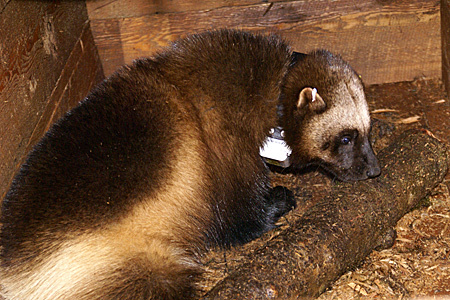 Wolverines are active at any time of day, year round. They have tremendous physical endurance. Movements of 40 miles in a day have been documented. Because of their great endurance, strength, and foraging behavior, wolverines have become a center of folklore. However, its fierce reputation has often been exaggerated. They are known to steal furbearers from traps and to damage cabins but contrary to stories will not attack a larger predator, like a wolf or a bear. Instead, they avoid these animals as encounters with either of these predators may be fatal to the wolverine. Wolverines will defend a food source or its territory against other wolverines or smaller predators. Wolverines travel extensively in search of food. In general, males have larger home ranges that females, females not accompanied by kits have larger ranges compared to females with kits, and home range size and use changes with season of the year. 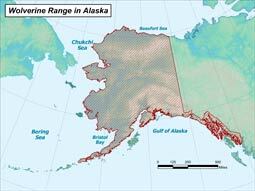 In Alaska, resident male home range sizes are large ranging between 200-260 square miles. Resident females have home ranges as large as 115 square miles. Home range size and use patterns are thought to be a response to the availability of resources being food or for adult females the presence of persistent snow cover for denning. Studies in Southcentral Alaska found that wolverines preferred higher elevations during the summer and lower elevations during the winter due to varying food availability. Data indicate that wolverines will move long distances in short periods of time to take advantage of these resource sites. It appears that few wolverines live longer than 5 to 7 years in the wild. Some, however, do survive to 12 or 13 years of age. The primary natural mortality factors are starvation, being killed by larger predators, primarily wolves, and by other wolverines. Wolverines are vulnerable to harvest and because of their limited reproductive capability can be sensitive to overharvest. Sustainable harvests in heavily trapped areas of Alaska depend on the presence of refugia as the source population of wolverines. Wolverines are opportunistic; eating about anything they can find or kill. They are well adapted for scavenging. The wolverine has a powerful jaw and large neck muscles allowing it to crush and utilize bones and frozen flesh. Also, wolverines can survive for long periods on little food. Their diet reflects annual and seasonal changes in food availability. In the winter wolverines primarily rely on carrion, remains of moose and caribou killed by wolves and hunters or animals that have died of natural causes. Throughout the year, wolverines feed on small and medium-sized animals such as voles, squirrels, snowshoe hares, and birds. In the right situations, wolverines can kill moose, Dall sheep or caribou, but these occurrences are rare. They have been known to take the young Dall sheep in the spring when they are most vulnerable. Wolverine litters are born between February and April. Data on wolverine denning habits in Alaska are limited but indicate that in Interior and northern Alaska most young are born in snow caves. These caves usually consist of one or two tunnels that can be up to 60 yards long. No litters larger than four have been reported in the wild and average 2-3 kits. Wolverine kits are born blind and weigh less than 1 pound (0.4 kg). They develop rapidly and are weaned at about 9-10 weeks of age. Adult size is reached by early to mid-winter. Kits become independent from their mother in the fall at approximately 5 or 6 months of age but mostly remain within their natal home range until they become at least 1-year-old. Most males leave their natal home range at about 1-years of age and can range over an area of thousands of square miles over the next 1-2 years before securing residency of an area. Females can stay in the area they were born up to 3 years old and may settle there if the resident female dies. Both male and female wolverines become sexually mature in their second year but < 10% of the 2-year-old females produce litters. The breeding season extends from May through August. After mating, the fertilized eggs remain in the blastocyst stage until implantation occurs during until late fall or early winter. This type of reproduction is known as delayed implantation and allows a female wolverine to become pregnant when food supplies are best and when she is in good physical condition. Adult females may fail to produce young in some years even when they successfully breed. Data indicate that the abundance of food determines whether a pregnancy will be maintained and the number of young that will be born. Wolverines are found at low densities across Alaska. Results from a cooperative study with Chugach National Forest indicated a wolverine density of 4.5 to 5.0 wolverines per 1,000 square kilometers in Kenai Mountains and Turnagain Arm area, which is typical for other areas of South-central Alaska. Home range estimates for wolverines in South-central Alaska show females use about 300 to 600 square kilometers (115-230 square miles) and males use about 700 to 1,000 square kilometers (270 to 380 square miles. The continued health of wolverine populations in Alaska is best assured by both protecting large expanses of wilderness and preventing overharvest. Preservation of their habitat is of key importance to their successful management. Much wolverine habitat is now protected in the state through various federal and state land dedication programs. However, as human recreational pursuits expand into more remote areas, greater protection of natal denning areas may become an important management issue. Adult males are 30-40% heavier than females and generally weigh 24-40 pounds (11-18 kg) while adult females weigh 13-26 pounds (6-12 kg). Wolverines are a wide-ranging species that naturally at low densities and require large expanses of wilderness. Formerly distributed throughout the taiga and boreal regions of North America, wolverine range has receded substantially primarily from most of the eastern United States and Canada. In Alaska, wolverines reside throughout mainland Alaska and some of the islands of Southeast Alaska. Wolverines are opportunistic; eating about anything they can find or kill. They are well adapted for scavenging. Their diet reflects annual and seasonal changes in food availability. In the winter wolverines primarily rely on carrion; throughout the year, wolverines feed on small and medium-sized animals such as voles, squirrels, snowshoe hares, and birds. Wolverine litters are born between February and April.. No litters larger than four have been reported in the wild and average 2-3 kits. carcajou (French Canadian/Algonquian origin), glutton.